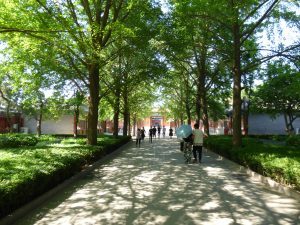 Nestled in the heart of the city in between the bright lights and chaotic streets of central Beijing, you’ll find the peaceful oasis of spirituality known by many names. 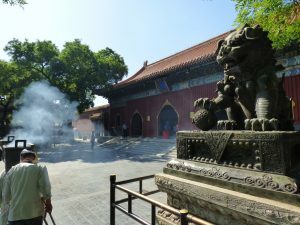 To some its marvellously named the Harmony and Peace Palace Lamasery, but what most know as the Yonghegong Lama Temple. 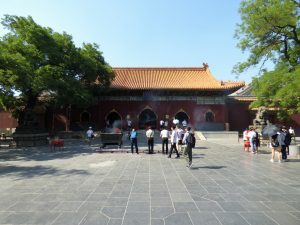 This stands as the largest and most perfectly preserved lamasery in China, still functioning to this day, as the monks walking the grounds would support. As the Lama Temple is closely nestled within the centre of the city, the obvious method of transport to get there will be by subway. It’s easy reach from anywhere in the city; Yonghegong Lama Temple Line 2 or 5. From exit C you’ll spot a convenient first look at the temples exterior red walls as you follow the long trail towards the entrance passing various capitalising locals advertising their merchandise. The entrance fee is a reasonable 25 CNY (about £2.50) or 50 CNY (about £5) for an English audio guide. Open from 9am to 4.30pm. Important note for keen photographers; China does not allow any photographs of any statue of the Buddha. You’ll be reminded repeatedly with conveniently placed signs where you’re most likely to want to take a snapshot. From the entrance gates you’ll begin your first steps along the long route northward along the arrow straight imperial carriage way which leads to the temple courtyards. 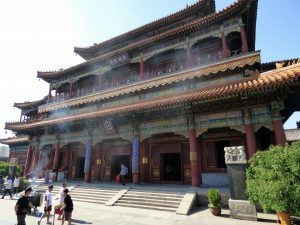 You’ll be walking in the footsteps of emperors and empresses from Qing Dynasty, although such royalty would never have to waste energy by needless stepping. Rather, the paving stones are worn smooth by centuries of emperors carriages guiding them towards the courtyards. This is the first of many emperor themes. 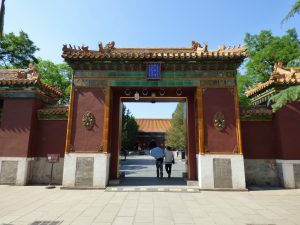 At the end of the carriageway you’ll be met by the beautifully designed Zhaotai Gate which marks the entrance into the courtyards and stands as the original outer wall of the temple. Consider yourself royalty as the gate would solely be used for emperors. Inside you’ll also find the first of many dedications to the Buddha; this particular one being of the big bellied variety. To the right of the courtyard you’ll find the Drum Tower and Bell Tower standing tall disguised within the trees that surround it. As you move onward north you will reach the main palace in the temple grounds; Yonghe Hall. Otherwise more pleasantly known as the Hall of Harmony and Peace. Within this hall much like every other in the grounds you’ll find some spectacular figures and representation of Buddha. Inside this particular hall you’ll find three bronze statues of the Buddha, all representing a unique part of time; past, present and the future. The present Buddha is symbolically situated in the centre of the hall. 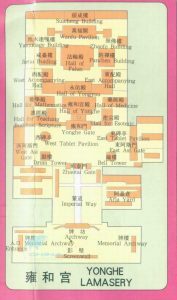 Further on north you’ll find Yongyou Hall. Going back to the royalty theme, this building became the original place of residence for an Emperor before he was throned. This hall also became the very same Emperor’s resting place at the time of his death. These days, the hall holds yet another dedication with 3 statues of the Buddha, this time with each representing their unique seciality; Longevity Buddha, Medicine Buddha and Wisdom Buddha. Keep heading north and you’ll find possibly the most significant site to the monks that inhabit the temple; Falun hall. Much like every other structure, it also has a spectacular alternative name; Hall of the Wheel of the Law. Just like the rest of the structures around the temple they are designed in traditional Chinese architecture with a Tibetan influence. Fitting that such an immaculate structure was dedicated to be the home for the Emperor’s many wives. These days the hall is dedicated to more spiritual purposes as a site for Buddhist prayers and scripture reading. At the centre you’ll find the alter along with sacrificial offerings before a large statue dedicated to Tsong Kha-pa, the founder of Lamaism. Surrounding the alter at all sides you’ll see 500 Arhats strategically placed out for lamas to perform their Buddhist rituals and read their scriptures. Yet again following north, you’ll find possibly the mightiest site on the whole temple grounds; Wanfu Pavilion, otherwise spectacularly named The Pavilion of Ten Thousand Happiness. This is the tallest building in the entire temple, and with good reason. Within you’ll find a 26-meter-tall statue of the Buddha. Its so tall it had to be placed INTO an enormous hold in the ground. This unbelievable awe inspiring figure was carved out of a single white sandal wood tree trunk. No wonder this statue used to hold a Guinness world record. 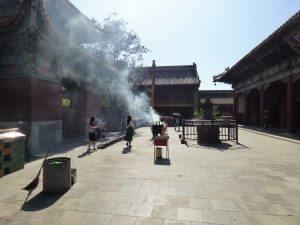 A rare tranquillity and upmost spirituality is found around the truly peaceful grounds of the Lama Temple. Compared to the chaotic madness of Beijing’s 100mph street life, nestles one of the most significant religious grounds in China. 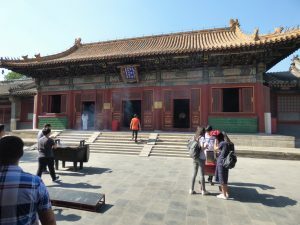 As you walk around the northward courtyards you’ll wander through endless clouds of earthy incense pervading into the air and the monks to which the temple holds such an intense significance. You’ll see prayers wheels laid out with equal numbers of dedicated spiritualist and curious tourists laying their prayer as it spins. This undoubtedly qualifies to become one of Beijing’s best highlights.